Generally, people have very less information about the difference between these two types of dehydrators. Therefore, below we will discuss all the details along with the pros and cons of each dehydrator so that you can easily differentiate between the two. Thinking to buy Stainless steel dehydrators? then here we Collected T﻿﻿op 11 Best Stainless Steel Food Dehydr﻿﻿ators. ​A stainless steel food dehydrator is a kind of appliance whose body, as well as the trays, are made up of steel. It is considered more effective than other types of food dehydrators that are accessible in the market. You can use this appliance even during the night time also as it produces very less noise during the entire dehydration process. In order to make you more clear about this product, we are providing you all the pros and cons of this appliance. The examples for this type of food dehydrator are Excalibur ﻿D900CDSHD. ​A stainless steel food dehydrator is considered to be a professional appliance that is used by an expert cook or a chef. Even though, it is expensive in cost but the features and the benefits that you will get from this machine will compensate that in the future for sure. ​When you place this food dehydrator on the countertop of your kitchen, it will provide a more contemporary look to it. Overall, you can enhance the beauty of your kitchen by adding this appliance over there. ​It is very easy to clean and wash a stainless steel food dehydrator as the stains do not get stick over it for the longer duration of time. So, you can save your lot of time that you might have to waste on cleaning other types of dehydrators. 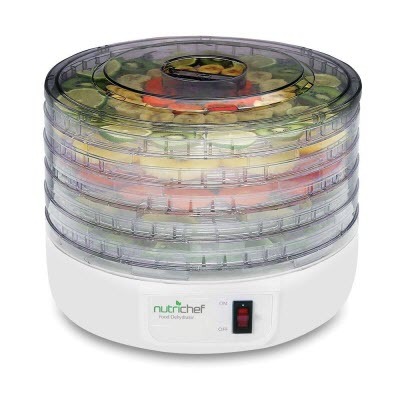 ​During the process of dehydration, this food dehydrator produces very less noise. So, you can easily use this appliance for drying out nay food item during the night time without disturbing your other family members sleep. ​A stainless steel food dehydrator is energy efficient also do not consume large power consumption during the dehydration process. Therefore, you can save a lot of money that you might have to spend in paying the long electricity bills of your home. ​This appliance can also withstand high temperature without damaging the product and the food items. The trays of the food dehydrator also remain in the original shape even after getting expose to high heat for longer time period. ​Due to the material which is used in manufacturing this machine i.e. stainless steel, this food dehydrator turns out to be a durable product also. There are very fewer chances of breakage or crack in this appliance as compared to the other type of food dehydrator. ​If you are looking for a long lasting and enduring product for your kitchen that provides you the facilities of food dehydration for the lifelong period, then a stainless steel food dehydrator is a must appliance for you. You just have to take proper care of this appliance and rest it will do for you. ​Normally, in a stainless steel food dehydrator a feature of horizontal flow of air is provided so that it can bear more heat during the drying process. 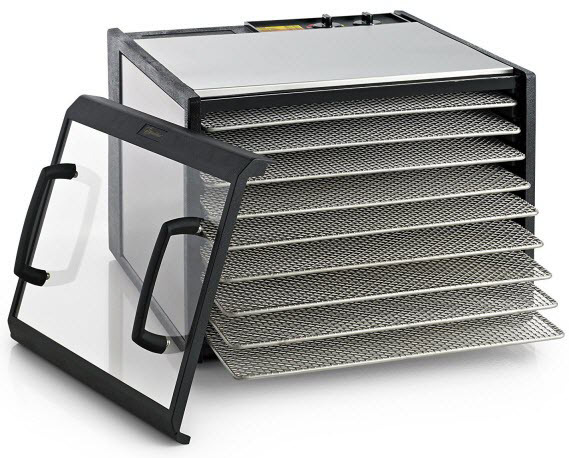 So, if you are residing in a bigger size family and also have to dehydrate food items that require high heat, then you should go for a stainless steel food dehydrator. ​In order to buy a stainless steel food dehydrator, you have to spend some extra money as compared to the other type of food dehydrator. Due to a use of steel material in manufacturing, this appliance becomes expensive to purchase. ​The one more shortcoming of this product is that they do have a tendency to gather some deposits of calcium that can be noticeable over it. It will be more visible in the light color product. However, you have to do proper care of this product if you want to have its services for the longer period of time. ​It is quite obvious that a food dehydrator which is made up of stainless steel will be heavier than the plastic dehydrator. So, if you want to move it from one place to another, then it might create a problem for you due to its weight. ​A plastic food dehydrator is an appliance that is made up from the plastic material. This type of dehydrator is a perfect option for those who have a limited budget since this is less costly as compared to the stainless steel food dehydrator. The common examples of this type of food dehydrator are Nesco Square-Shaped food dehydrator, Presto 06300 food dehydrator, Waring Pro DHR30 food dehydrator, etc. ​A plastic food dehydrator is available at reasonable price rate in the market as compared to the stainless steel food dehydrators. Therefore, if you have a very limited budget of buying a food dehydrator then a plastic one will be a perfect option for you. ​You can easily clean and wash plastic food dehydrator after drying out your food items in it. These are also dishwashers safe but still you must check out the instructions booklet that is provided along with this appliance. ​A plastic material is always lighter than the stainless steel material and same is the case of the plastic food dehydrator. Since this appliance is manufactured from the plastic material you can easily carry and move it to any part of your kitchen. ​The full form of BPA is Bisphenol A which is a chemical that is easily found in plastic products like food dehydrators. This chemical is also known as an “Endocrine Disruptor” (for example: heart and kidney issues, asthma, etc) which can effortlessly obstruct the human hormone structures. So, human body part which is controlled by hormones might get influenced by excessive contact to BPA. It is recommended to see BPA free food dehydrators while buying plastic dehydrator. ​One of the major drawbacks of a plastic food dehydrator is that it is more prone to the spills and the stains which might get stick to it during the dehydration process of the food items. You cannot even rub them hard to remove the stains as it might damage the product. ​When the plastic food dehydrator is utilized for the food items (like jerky) which require high temperature, then its plastic mesh trays can get melted or might lose its original shape. This is one of the main weaknesses of this appliance that it cannot withstand a much higher temperature. So, you have to keep an eye during the entire procedure of food dehydration in this appliance. ​A plastic food dehydrator is quite loud during the drying out of the food items. So, it will be very annoying if you use it during the night time as it might disturb your family members a lot. ​Plastic food dehydrators are not manufactured in such a way that it can bear the heat of the high temperature. So, it will be advisable that you should not try to dehydrate those food items in this appliance which require high heat. Q: What type of food dehydrator is less expensive to buy i.e. a stainless steel food dehydrator or a plastic dehydrator? A stainless steel is expensive as compared to the plastic food dehydrator owing to the material used in manufacturing these appliances. So, if you have the low budget to purchase then you should go for the plastic food dehydrator. Q: Can I dehydrate any food item which requires high temperature in the plastic dehydrator? The food items like meat and turkey require high-temperature heat (155 degrees F) so it will not be advisable to dry out them in the plastic food dehydrator. But, if you want to dehydrate raw food like fruits and vegetables that require low heat (125 degrees F to 135 degrees F) then you can use this appliance. Q: How much time does it take to dehydrate food in a stainless steel food dehydrator? The time that will be taken by a stainless steel food dehydrator totally depends upon on a number of factors; for example, at what temperature you desire to dry your foodstuff, the surrounding atmosphere, the dimension of the fragments of food being dehydrated, the preferred quality of the end outcome and the complete content of the moisture in the food. Q: Can I use a stainless steel dehydrator for dehydrating anything besides the food? A stainless steel dehydrator is a very multipurpose appliance and can be utilized to dehydrate an extensive range of other items. You can use this appliance for drying out the clay and metallic ornaments pre-gunfire, items of cake decorations, drying the flowers and preparing potpourri, spices, herbs, etc. Q: Can you tell me that which is the long lasting food dehydrator among the stainless steel and the plastic dehydrator? A plastic food dehydrator has less life as compared to the stainless steel food dehydrator. A plastic dehydrator requires more care and maintenance also but this is not in the case of the steel dehydrator. Q: Does plastic food dehydrator make any noise? Yes, plastic food dehydrator makes noise while making food in the appliance. So, if you want to use this appliance in the night time, then it might disturb the sleep of your family members at your home. Q: I want to buy a food dehydrator which is lightweight to carry. Please suggest? If you want to purchase a lightweight food dehydrator, then a plastic dehydrator is the best option for you. You can easily move it from one place to another and also carry with you during the long trips. Q: Which food dehydrator (stainless steel or plastic) possesses stylish looks? A stainless steel food dehydrator possesses stylish and elegant looks that will increase the overall appearance of your kitchen. You can proudly show it to your friends and relatives by placing it on the main countertop area of your kitchen. It works as a decor for your home also. Q: Can I easily clean a plastic food dehydrator? It is difficult to clean this appliance as the stains get stick over the plastic surface of the dehydrator. So, you have to carefully wash and clean this product without damaging it. In the end, we can say that both types of food dehydrators (i.e. stainless steel and the plastic) possess its own strengths and flaws. So, it is up to you that which product suits you according to your requirement. All the above information will help and guide you in making a good decision in the end. We have tried our best to provide you an accurate and beneficial info regarding both types of food dehydrators. Whatever product you choose, the ultimate benefit from any of the appliance is that you can enjoy having healthy and nutritive snacks with very less cholesterol at your home. For so many families in the world, a food dehydrator has been working as a blessing for them and we are sure that you also make a perfect decision like them in the end about which you will not ever regret in the future. This is ridiculous. You are comparing the Cadillac of stainless steel dehydrators with the Chevette of plastic dehydrators. I am thoroughly disappointed that you were not comparing two USA made Excalibur dehydrators. Also, you have poor grammar and even incorrectly named your blog in your “About Linda” mini-bio (once Dehydrator Blog, once Dehydrated Blog).